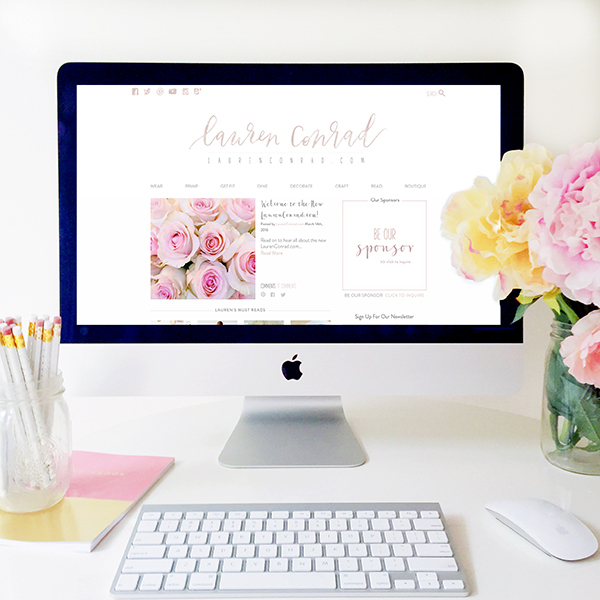 Those of you who are reading this may have already noticed that things are looking a little different around here… That’s right; LaurenConrad.com just got a major makeover! We blog about home and beauty refreshes all the time, but in our opinion this makeover takes the cake. This is the first big design overhaul that the site has gotten since it launched almost five years ago, and we could not be more excited about it. The whole team has been hard at work on this redesign for months. And trust us when we say that it was a very hard secret to keep! We’re so happy that we can finally share the new site with all of you. Lauren wanted the new site to reflect all the changes in her own life and her personal aesthetic since LaurenConrad.com first launched. The new site is still filled with the delicate and special design details LaurenConrad.com is known for, but it’s a cleaner, more grownup version of the original. It will also be a lot easier to navigate from your mobile device, which we’re pretty thrilled about. For those of you who are curious as to how a website redesign happens, we started by having the amazing Courtney of POPPYjack Shop help us with a brand new logo. Courtney’s calligraphy is just so pretty, that we thought it would make for the perfect refreshed LC.com logo! Then, our web designer put together a few mood boards that each contained different color stories, fonts, and details (based on a secret Pinterest board of inspiration we gathered from around the web). After narrowing down our favorite elements from each, she got to work laying out the pages using these elements. The pages went through several more rounds of notes and revisions, and finally we had beautiful webpage designs to hand over to our web developer to implement. After that, our developer implemented everything on a test site first so that we could check for bugs and make sure everything looked the way it was supposed to. Finally, he pushed the new designs live on LaurenConrad.com. And here we are, several months later. Phew! What do you think of the new LaurenConrad.com? Heads Up: The New LC.com is Here!